Paying attention to food and beverage trends is important to foodservice professionals. If trends aren’t monitored, menus turn stale resulting in decreased new and return customer traffic. With the world paying closer attention to eating healthier, it seems conceivable that menu options should be mindful of this evolution. Ten years ago, consumers were used to seeing milkshakes on beverage menus. Today, menus are beginning to offer healthier alternatives for consumers’ steering away from high-fat, high-calorie foods. 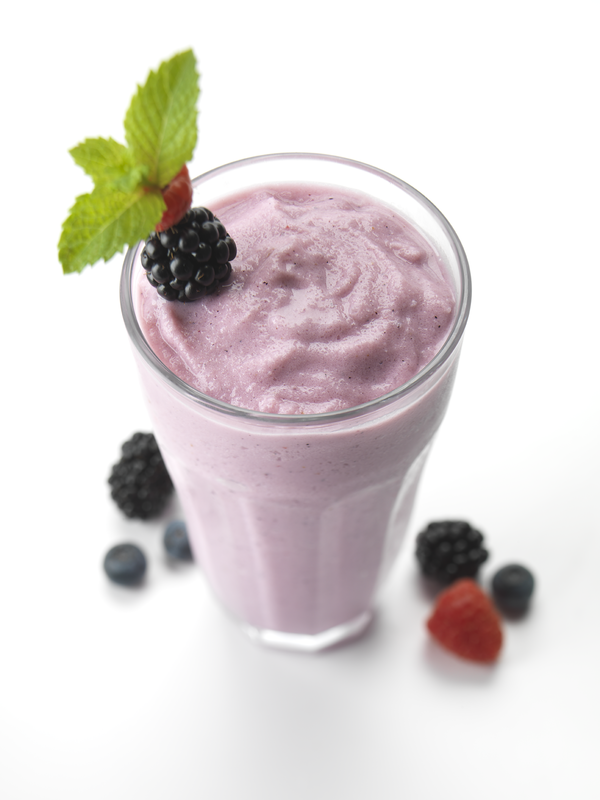 According to a recent Mintel® survey, 68% of people would like to see more restaurants offer smoothies. Fruits and vegetables are the pillars of healthful eating. An easy way to accommodate the healthier-eating food trend is to offer smoothies. Frostline® Simply Smoothies™ base mix offers a low cost of entry into the blended beverage category. The mix is a dry base mix that easily blends with water or juice, ice and your choice of additional ingredients like fresh, frozen or canned fruit in a traditional blender. This versatile mix can be used with a wide array of ingredients to create delicious, profitable smoothies. We suggest starting small and offering the top two smoothie flavors – Strawberry and Strawberry/Banana. When you are ready, branch out to Mango, Peach, or Pineapple flavors. Once you feel comfortable this blended beverage is working for you, create a smoothie menu and offer seasonal flavors or specialty flavors. With the neutral base mix, you can add anything from peanut butter to Girl Scout Cookies to carrots or kale. The possibilities and combinations are endless! There isn’t a worry of waste because smoothies, like milkshakes, are made to order – one 16 oz. serving at a time. Operators can see more than 50% gross margin on one smoothie. The reason being, in each case of bulk mix, there are four – 4.8 lb. 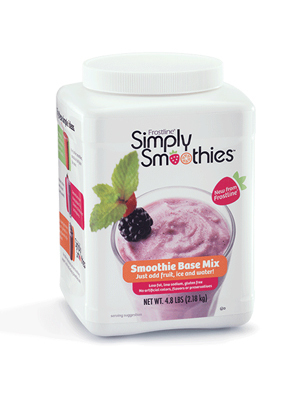 containers of the base mix and each container yields approximately 39 smoothies – over 150 smoothies per case! Our base mix is also available in convenient, individual serving packets. There are 50 packets in one case. 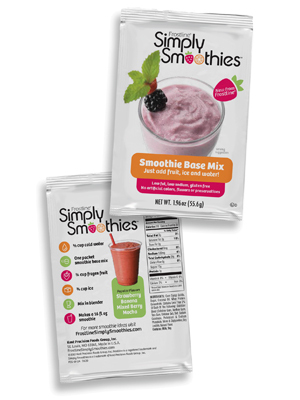 Simply Smoothies® can help you make use of ingredients you already have on hand in order to avoid spoilage concerns. If you decide to try smoothies, you have Simply Smoothies® support! Operators can choose from a variety of complimentary, high-quality, point-of-purchase materials including posters, stickers and clings. Each piece was professionally designed to keep your smoothies top of mind with customers for increased sales. Although free merchandising materials are available for order, you can download and print the files anytime from our website. We host a wealth of product information on our website: unique flavor combinations, promotion ideas and seasonal recipes. We’re happy to send you a sample. Visit us at FrostlineSimplySmoothies.com and complete the Contact Form.